New Nationwide Standards for goldfish are finally here! It's taken 27 years, but the Nationwide Committee has agreed on and released its new standard for goldfish varieties. It all started back in 1989 when members of the six goldfish societies in the UK met at their Open Shows and complained about judges using their own, different, standards. It was agreed that two representatives from each society would meet to design a universal standard for the many goldfish varieties they breed and show. There then followed many years of disagreements. Eventually a tentative first edition of Nationwide Standards was agreed and published for the Societies to try at their Open Shows. As the millennium arrived, changes in the club scene meant that both Scottish clubs closed and a new society started (North East Goldfish Society). Many new Goldfish varieties were arriving from the Far East too. So the reps met again to review and update the tentative standards in the current publication.
) to concentrate on revising the old standards, corresponding via emails and eventually meeting at a venue in Telford. 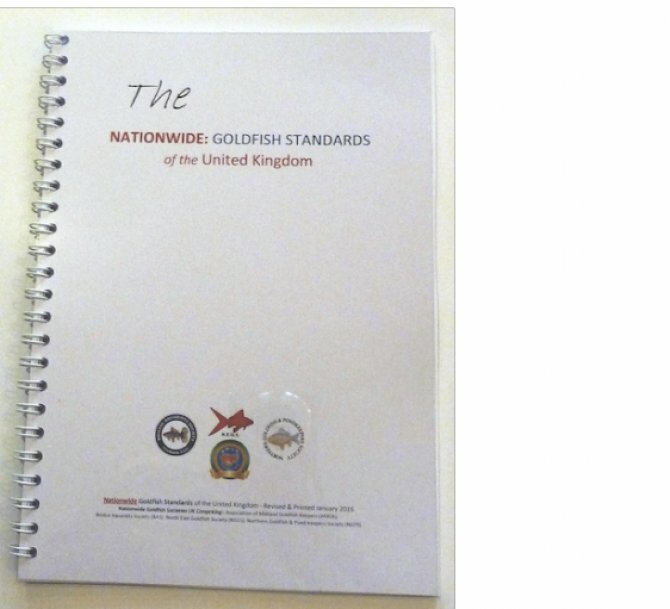 It was decided there that the title needed to be changed to 'Nationwide Goldfish Standards of the United Kingdom'. Changes to accommodate new goldfish varieties and breeding developments were approved (after lots of computer designed drawings were modified). 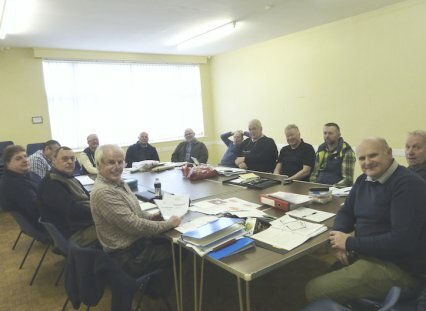 The final, historic meeting took place on January 24, 2016 (pictured above), at Horsehay Village Hall near Telford where the final publication was approved and the computer documents sent to the printers. The document has been placed online by the member societies, while the printed version (A5 format) is available at £3 (plus postage) from the relevant Chairman of the four societies.